The Quadrantids is the first meteor shower of the year and kicks things off in fine fashion on the night of January 3/4, although inclement weather can often disappoint keen observers wrapped up warm in the long January night. The good news is that this year's peak will not be blighted by excessive, swamping moonlight, with the young moon setting early evening. The not so good news is that the peak is predicted for 18h UT, when the shower's radiant, the area of the sky where the meteors appear to originate from, is still rather lower in the north-north-western sky. Under the best conditions the Quadrantids can produce up to a couple of meteors a minute in their short, sharp maximum, with best activity confined to a six-hour period within their normal limits of 1-6 January. There is quite a wide disparity in the quoted zenithal hourly rate (ZHR), (the probable number of meteors observed per hour from a shower having its radiant at the zenith), with figures as high as 120 or as low as 60. As the evening wears on the radiant will steadily climb to be 30 degrees or so up in the north-east by 1am, increasing the chances of seeing activity despite being past the time of the shower's predicted peak. The radiant lies in northern Bootes, east of Alkaid (gamma UMa), at the end of the Plough's handle near the shared border with Draco and is circumpolar from the UK. 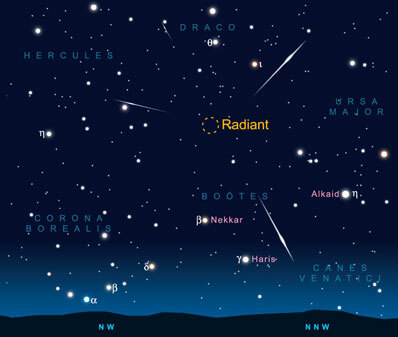 The reason why the shower has the moniker the Quadrantids is that this area of the sky used to be known as Quadrans Muralis, a now defunct constellation covering the area between the right foot of Hercules, the left hand of Bootes, and Draco. It was introduced in 1795 by J. Fortin, maker of globes and spheres for the French royal family. The figure represented the mural quadrant of Joseph Jerome de Lalande, the 18th century French astronomer who charted 50,000 stars with the quadrant while at the collège de France. He took his inspiration from his countryman Nicolas Louis de Lacaille, who charted the southern skies some years earlier, inventing many of the southern constellations still in use today. Quadrantids meteors are slow to medium speed, around 43 km/s, compared with 35km/s for Geminids and 71km/s for Leonids. Around 10 percent leave a persistent, glowing trail or train, with the brighter ones often appearing blue and yellow. Like the Geminids, the shower appears to be produced from the debris of an asteroid (2003 EH1), possibly the extinct nucleus of a comet that broke up centuries ago.